Rich, milky, cardamom laced cakes with mawa / khoya - these are mawa cakes for you. Mention these and most likely people will recall Irani cafés in Mumbai famous for mawa cakes, bun maska (bread and butter) and Irani chai among other things. No, I haven't been to Mumbai in ages, much less to one of these Persian cafés. The city supposedly had a good number of these little cafés, but now the numbers have substantially dwindled down, thanks to the ever growing numbers of new age restaurants and coffee shops. Milk, cream and mawa. You either love them or hate them. I love them!! How about you? 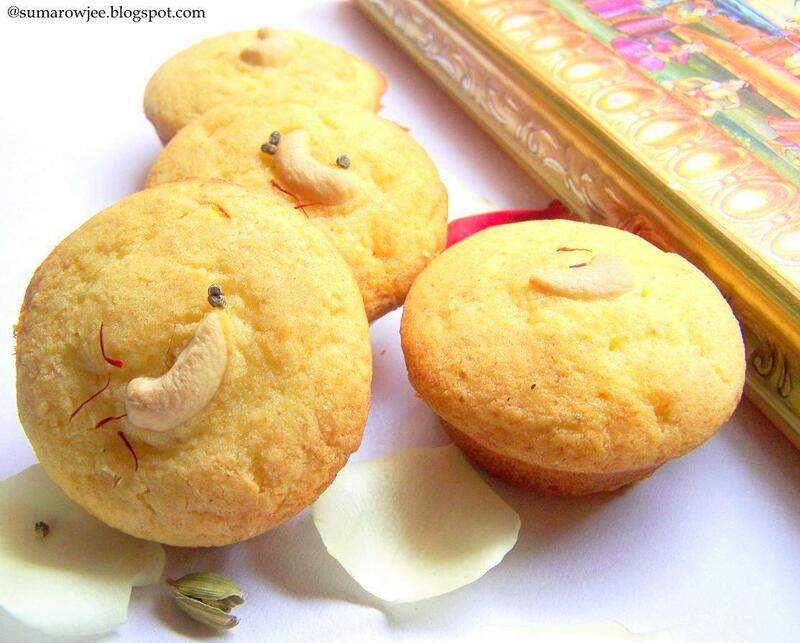 My affinity for these milky things and the urge to bake something with a traditional twist during Diwali, led me to bake these little cakes. Perfect for the very festive mood in the air! Honestly, when beauties like these peek out of a blog as stunning as Helen's Tartelette, you don't really need Diwali around the corner to bake a batch of mawa cakes! These cakes are among those meant to be slightly dense I suppose, given the khoya that goes into it. But I wanted the cakes a little lighter, so I have increased the amount of baking powder, threw in a pinch of saffron for good measure! 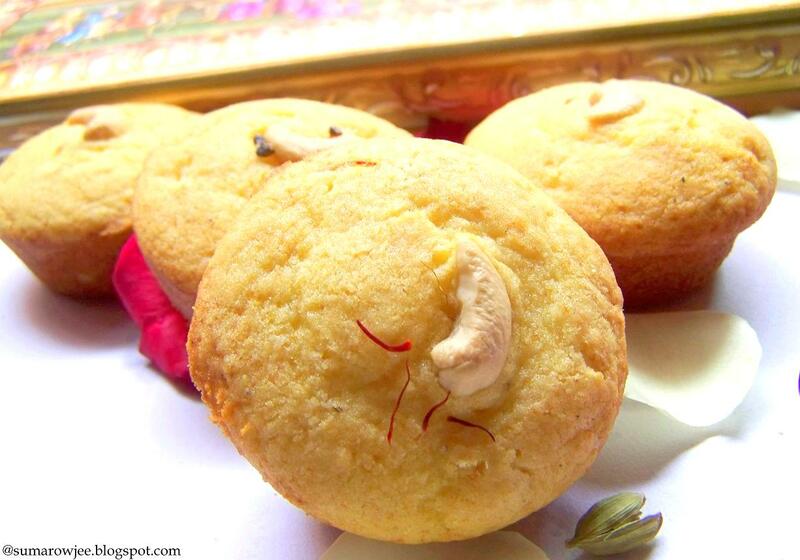 Saffron, cardamom and mawa - can't go wrong together really! For once, when I baked, I felt happy that I live in India with the luxury of being able to simply buy some khoya at a one of the sweet shops around the corner. If you don't have access to ready mawa, you would have to make it as Helen does. The cakes are rich, so small they would have to be for me. Bake them as bigger cupcakes, or in charming canele moulds (really pretty) or maybe in mini cake tins or mini bundt pans. The baking time would then vary of course. Chopped toasted nuts folded into the batter will add a nice crunch and complement the flavors of saffron and cardamom very well. Some chopped nuts sprinkled on top before baking are just the perfect adornment for these tea-cakes. Procedure : Pre-heat oven to 180 degrees C / 350 degrees F. Spray your muffin tray or cupcake moulds with baking spray or lightly grease and flour the tins you would use. Grind the cardamom with a tablespoon sugar (out of the 50 grams). Soak the saffron strands in the warm milk, allow it to release its flavors and come to room temperature. Sift the flour, baking powder and soda 2-3 times. Keep aside. In a medium sized bowl, place the butter, mawa and sugar and the crushed cardamom-sugar. With your hand held mixer, mix on low for a few seconds (the ingredients will at first look like they won't come together, but they will) and then increase the speed to medium (speed 3) and cream the mixture till pale and fluffy, about 3-4 minutes. The mixture will be fluffy, but you can still feel the slight grittiness of the khoya. On low speed (speed one) add the egg, beat till it disappears into the butter mixture (this will take just a few seconds). Turn speed to medium, beat for a minute. Add the flour mixture and the milk in two additions. The batter will be of dropping consistency. Fold in the toasted nuts if using. Sprinkle nuts on top. Bake for about 15-16 minutes (for mini muffins) longer if baking bigger ones, even longer if baking as one cake. The tops will be light golden and a tooth pick inserted in the center will come out clean. Do not over bake or they will be dry. Better to check a minute early than late. Cool in the tins for a couple of minutes, then remove and cool completely on the rack. They were soft immediately on cooling, picture below not exactly pretty, but want you to see the crumb. Were relatively dense later, but still delicious! I loved them soft! So, this Diwali if you want to take a break from the usual mithai and chocolate, bake something deliciously different, try these cakes! wow that is super tempting!!! 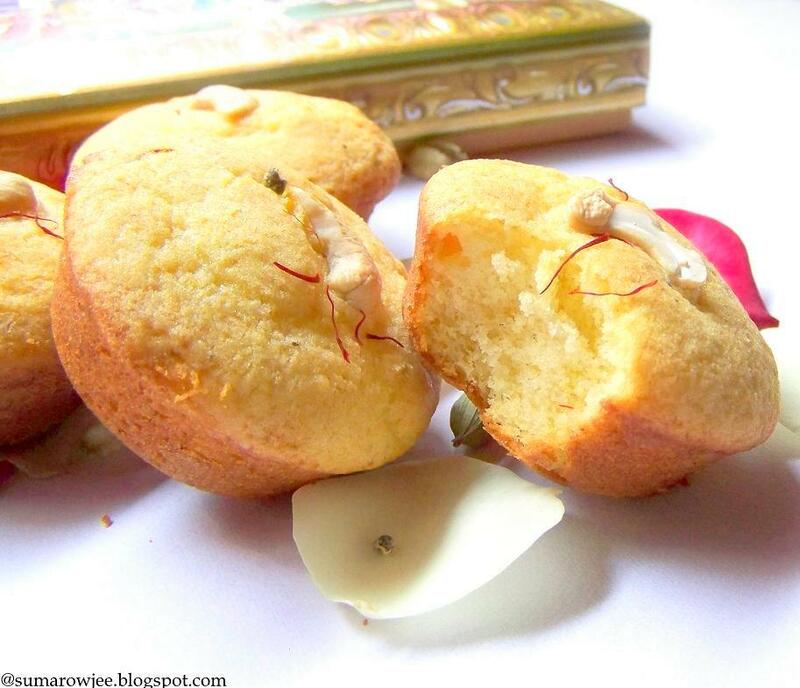 love the combination of saffron, mawa and cardamom!!! Cake looks yum! Happy Deepavali Suma! 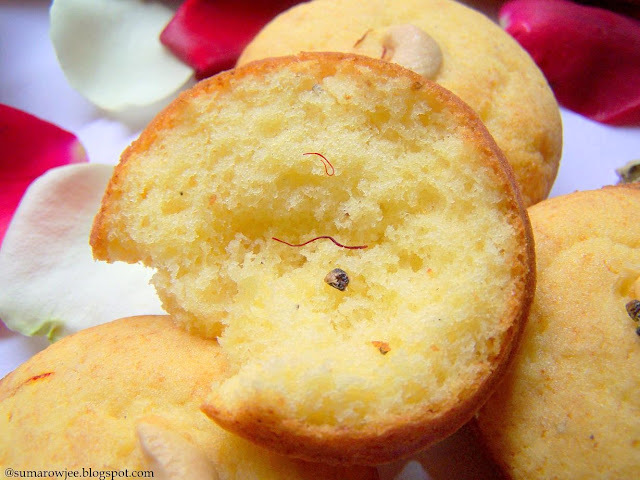 I have been to Irani cafés while in Mumbai and have fallen in love with their Mava cakes, they are delicately flavoured and are indeed delicious. These cakes look cute and sinful. Happy Diwali to u and ur family Suma. Perfectly baked cakes. looks really yummy, soft and moist. Cake looks wonderful..spongy and moist.